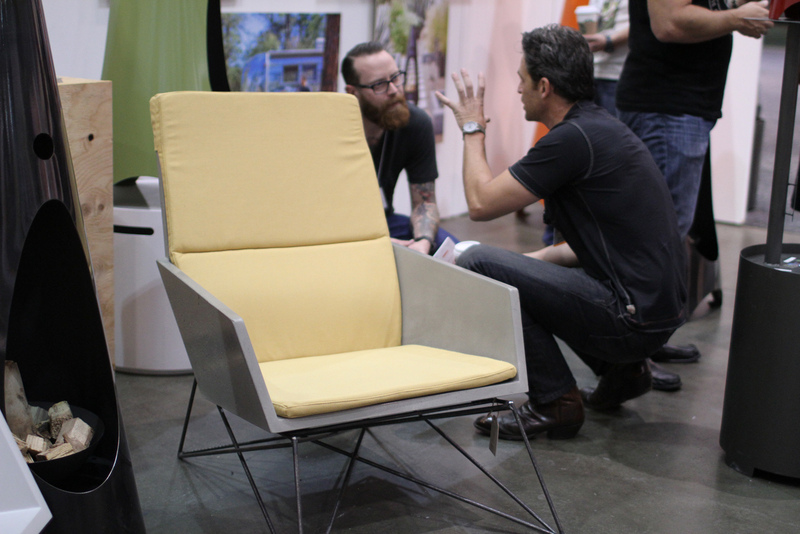 This year's Dwell on Design exhibitors presented an impressive array of goods ranging from kitchen and bath, furniture and accessories, outdoor, and lighting products. In the following slideshow we share the Dwell on Design Award winners. Hard Goods's modern Muskoka chair won first place in the very competitive Furniture category. Best Outdoor Product went to the G Pod. The winners of the 2011 Swiss Design Prize are on view at booth #1301 in their first U.S. stop. Designer Annette Douglas won Best Textile. In the Modern Lifestyle category, the Cricket Trailer (which we featured in our October 2011 issue here) was the clear frontrunner. Another view of the award-winning Cricket Trailer on the Dwell on Design show floor. Noble Environmental Technologies wins for its post-consumer "cardboard" called ECOR. Duravit (booth #645) took the bath category with their outdoor tub and screen. Over at booth #714, San Francisco's Urbio exhibited their magnetic vertical garden, which nabbed Best Accessory. Wolf's Steam Oven won the top spot in the kitchen category. See it at booth #1235. Best New Product went to the Cabrio Wall Bed by CLEI, distributed by Resource Furniture. Kohler won Best Booth for their tricked-out shipping container. Schmitt Design in booth #1115 won Best Lighting. The Energy award went to Lumos for their solar canopy. Visit their booth, #D03, to see the product in person. Quench Design, an exhibition showcasing designers from Queensland, Australia, won Best in Show.